The Count of Rouen was the ruler of the County of Rouen and the forerunner of the Dukes of Normandy. This title began when Charles the Simple of France could not do much about Viking raiding since the decline of Carolingian power. Consequently, the pirate leader, Rollo, a son of Ragnald I the Wise, Earl of Orkney, was given some of the land that he had been raiding. This grew into a large domain and entered into normal feudal and marriage relations with the rest of Europe. However, for many years there was little effective supervision from the Kings of France. Rollo (c.860 - c.932), the first Count of Rouen, was the Frankish-Latin name probably taken by Hrolf Ganger (Hrolf the Walker; Old Norse: Hrólfr Rögnvaldsson and Göngu-Hrólfr, Norwegian: Gange-Rolf, Swedish: Gångerolf). His nickname originated from being so big that no horse could carry him. He has also been called "Rollo the Gangler" in some works, and occasionally "Robert". With his followers (known as Normans, or northmen), Rollo invaded the area of northern France now known as Normandy. Wace, writing some 300 years after the event, gives a Scandinavian origin, as does the Orkneyinga Saga, with Danish or Norwegian being most likely. Unlike most Vikings whose intentions were to plunder Frankish lands, Rollo's true intentions were to look for lands upon which to settle. Upon arrival in France, and after many battles with the Vikings, the French King Charles the Simple understood that he could no longer hold back their advances. Consequently, he decided, as a temporary measure, to give Rollo the land around Rouen under the condition that he would convert to Christianity and defend the Seine River from other raiding Vikings. In the Treaty of Saint-Clair-sur-Epte (911) with King Charles, Rollo pledged feudal allegiance to the king, changed his name to the Frankish version, and converted to Christianity, probably with the baptismal name "Robert." In return, and in admission of defeat, King Charles granted Rollo the lower Seine area (today's upper Normandy) and the titular rulership of Normandy, centered on the city of Rouen. There exists some argument among historians as to whether Rollo was a "duke" (dux) or whether his position was equivalent to that of a "count" under Charlemagne. According to legend, when required to kiss the foot of King Charles, he refused to stoop to what he considered so great a degradation. However, since the homage could not be dispensed with, he ordered one of his warriors to perform it for him. The latter, as proud as his chief, instead of stooping to the royal foot, raised it so high, that the King fell to the ground. It is important to note that Rollo stayed true to his word of defending the shores of the Seine river in accordance to the Treaty of Saint-Clair-sur-Epte. However, in time he and his followers had very different ideas. Rollo began to divide the land between the Epte and Risle rivers among his chieftains and settled there with a de facto capital in Rouen. With these settlements, Rollo began to further raid other Frankish lands, now from the security of a settled homeland, rather than a mobile fleet. Eventually, however, Rollo's men intermarried with the local women, and became more settled as Frenchmen. 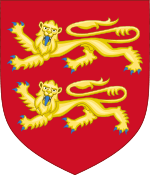 Rollo expanded his territory as far west as the Vire River and sometime around 927, he passed the Duchy of Normandy to his son, William Longsword. Rollo may have lived for a few years after that, but certainly died before 933. According to the historian Adhemar, 'As Rollo's death drew near, he went mad and had a hundred Christian prisoners beheaded in front of him in honour of the gods whom he had worshiped, and in the end distributed a hundred pounds of gold around the churches in honour of the true god in whose name he had accepted baptism.' Even though Rollo had converted to Christianity, some of his pagan roots surfaced at the end. William I Longsword (French: Guillaume Longue-Épée, Latin: Willermus Longa Spata, Scandinavian: Vilhjálmr Langaspjót; 893 – 17 December 942) was the second Count of Rouen from his father's death until his own assassination. The title dux (duke) was not in use at the time and has been applied to early Norman rulers retroactively; William actually used the title comes (count). Little is known about his early years. He was born in Bayeux or Rouen to Rollo and his wife Poppa. All that is known of Poppa is that she was a Christian, and the daughter to Berengar of Rennes, the previous lord of Brittania Nova, which eventually became western Normandy. According to the William's planctus, he was baptised a Christian. William succeeded Rollo sometime around 927. It appears that he faced a rebellion early in his reign, from Normans who felt he had become too Gallicised. Subsequent years are obscure. In 939 William became involved in a war with Arnulf I of Flanders, which soon became intertwined with the other conflicts troubling the reign of Louis IV. He was killed by followers of Arnulf while at a meeting to settle their conflict. His son Richard the Fearless, child of his first wife, Sprota, succeeded him. William also left a widow, Liègard (Liutgard), who died in 985. During the minority of his successor, Duke Richard, King Louis IV, who was making an expedition into Normandy, was captured by the inhabitants of Rouen and handed over to Hugh the Great. From this time onwards, the dukes of Normandy began to enter into relations with the dukes of France. In 958, Duke Richard married Hugh the Great's daughter. He died in 996. At the beginning of the reign of his son, Richard II (996-1026), there was a rising of the peasants, who formed assemblies with a view to establishing fresh laws for the management of the forests. This attempt at insurrection, described by William of Jumieges, and treated by many historians, on the authority of the poet Wace, as a sort of democratic movement, was put down with a firm hand. Richard III reigned from 1026-1027. He seems to have been poisoned by his brother, Robert the Magnificent, or the Devil (1027-1035), who succeeded him. In 1031, Robert supported King Henry I of France against his brother Robert, who was laying claim to the throne, and in return for his services received the French Vexin. The duke died on a pilgrimage to Jerusalem, leaving as his heir, an illegitimate son, William, born of his union with the daughter of a tanner of Falaise. ↑ For the Franks, Scandinavians were called Danes irrespective of their precise origin in Scandinavia. This happened, for instance, in the case of Hygelac, a king of the Geats, who is called Danish, something that has caused many a Danish scholar to state that he is the first historical "king of Denmark". That Dane was confused with Dacia, does not make the sources less confusing, and likewise the Geat Hygelac was not only called Danish but also Gothic and Getic depending on the manuscript.